50cc Scooter Quotes - You Could Save Up To 35% Today! Your 50cc scooter is your livelihood - and most people often rely on it to commute to and from work, as well as for social reasons. Here at One Sure Insurance, we pride ourselves on being one of the industries leading 50cc scooter insurance brokers. We have access to over 20 different 50cc scooter schemes - giving you the absolute best and most competitive quotes. With us, getting a motorbike insurance quote is simple. All we need is a few details from you, details about your motorbike, and we'll be able to instantly compare insurance quotes in realtime - letting you decide which scooter insurance quote is the best for you. 50cc Scooters have been around for decades. From the very first Italian models, all the way to Honda's leading models, there's no denying that Scooters represent one of the most economically stable methods of transportation. For most Scooter enthusiasts, a 50cc model will be their first experience. To ride a 50cc scooter, the driver only needs to pass a CBT test - making them easily accessible from as early as 16 years old. Packing plenty of power behind them, 50cc scooters work best when they are being driven through and around a city centre. Being able to filter traffic can save hours of commuting time over the period of a month. However, all of this needs to be covered by a 50cc scooter insurance policy. We're known as a bike specialist - helping you to get the absolute best prices for your bike. Whether you commute to and from work, or just simply pop down to the shop now and then, we can help to get you a competitive bike insurance quote. We are often able to source three different insurance policies for 50cc scooters - depending on our customers needs. Each insurance policy is slightly different, and covers different things - so it's important to think about what kind of cover you'll need, and to always think ahead. Third-Party Only Insurance: Third-Party is the most basic form of 50cc scooter insurance. With a third-party only insurance policy, you'll be covered against death and injury to other people, as well as damage to third-party property (such as a car, or a building). This policy will not pay out in the event of fire, theft or an accident that was your fault. Third-Party, Fire and Theft Insurance: This policy includes all of the perks of third-party only cover, as well as Fire, Theft and Attempted Theft. If your 50cc scooter is stolen, this policy will have you covered. Likewise, if your 50cc moped or scooter is set on fire, you will also be covered. This policy will not cover you against accidental damage. Comprehensive Insurance: Comprehensive insurance is often the most expensive 50cc scooter insurance policy - because it covers you against accidental damage. If you were involved in an accident that is your fault, this policy will still pay out the value of your scooter minus any applicable excesses. For total peace of mind, a comprehensive policy often works best - especially if you want to protect your scooter in the event of an accident. One Sure™ insurance knows how difficult it is for young riders to not only obtain insurance but also to find insurance at a competitive rate. This is where we feel we can help you, our team will compare the market on your behalf and find a policy which meets your scooter requirements at the best price possible. Call us FREE today or allow one of our 50cc scooter insurance consultants to call you back. 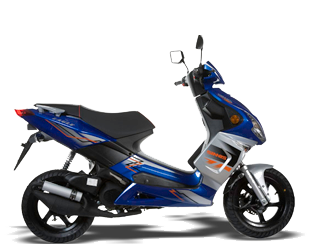 If you have a scooter that has a larger engine than 50cc, please feel free to visit our Scooter and Moped Insurance page where we will be able to provide cover for absolutely any scooter - regardless of engine size.